The second law of thermodynamics states that total entropy always increases over time in a closed system. Things break down! This is how we know the universe had a beginning, because if we extrapolate backwards, we cannot go beyond the point of zero entropy (maximum energy). It also tells us that the universe will eventually die a heat death. If you have read this far you now know that the human genome, along with every other genome, is also subject to entropy, continually degenerating over time. Therefore if we extrapolate backwards we come to a point at which it must have zero entropy and was perfect. Travelling forward in time we come to a point when all genomes will be extinct. If the above is true then where is the scientific evidence? If the prime axiom of evolution is incorrect then we should be able to prove it experimentally, that’s how science works. Gathering evidence of genetic entropy is obviously a huge problem with large, slow breeding species like humans where data would have to cover thousands of years. Scientists therefore look to species such as short-lived single celled bacteria. However, even here we face difficulties as they also have very small genomes and surprisingly low mutation rates per generation because every single cell is subject to severe selection pressure. The result is approximately one mutation per 1,000 generations. To see genetic entropy in action we need an organism with both short lifespans and high mutation rates. RNA viruses fit the bill perfectly. In 1918 the world was in the final stages of the First World War. However, a far larger killer emerged on the world scene that year in the Spanish Flu, or what is now known as RNA virus H1N1. The Spanish Flu is believed to have killed between 50 and 100 million people in three short years, far more than all World War One casualties combined. Since the initial outbreak, many samples of this virus have been collected periodically and preserved for future study. In recent years H1N1 has also been genetically sequenced. The results of one study found that an astounding 15% of its tiny genome of 12,600 nucleotides had mutated. In 2009 H1N1 was actually declared extinct. The preserved samples showed it had followed a perfect linear mutation accumulation rate and a perfect exponential biological decay curve over its 95 year existence. This was the first time science had seen an indisputable example of genetic entropy from start to finish. There are two other significant RNA viruses that have created pandemics in the modern world. The H2N2 outbreak of 1956 killed approximately 2 million people. Its offshoot, H3N2, originated in Hong Kong during 1968. Genetic sequencing has shown that both these viruses are now following the same exponential biological decay curve as the Spanish Flu. Thus evidence for genetic entropy is accumulating. In fact this rapid decay rate is now being explored as a potential weapon in fighting these diseases. I can hear you asking the question: Where did these viruses come from, to appear out of nowhere so recently. The answer is well known to microbiologists. Viruses and bacteria can lie dormant for long periods of time due to freezing, drying, semi-dormancy or sporulation. Most viruses spend much more time dormant than active. And there is one other recorded long term exponential biological decay in nature. This time it is actually in us humans. One ancient manuscript records the ages of humans over the last 5,000 years. The ancient Hebrew people faithfully recorded the lifespans of all descendants over 70 generations. The result is astounding. It also follows a near perfect exponential biological decay curve. Some will scoff at this data. But there are only two options for explaining its accuracy. Either these figures were made up to perfectly match an ancient and sophisticated scientific understanding of exponential biological decay curves that was only recently rediscovered, or the figures are real. Common sense suggests the latter. In addition to the Biblical evidence above, there is also great fear among geneticists that we humans are encountering ever-increasing genetic entropy. James Crow’s estimate of a 1% drop in human genetic fitness per generation will produce a slow biological decay curve. 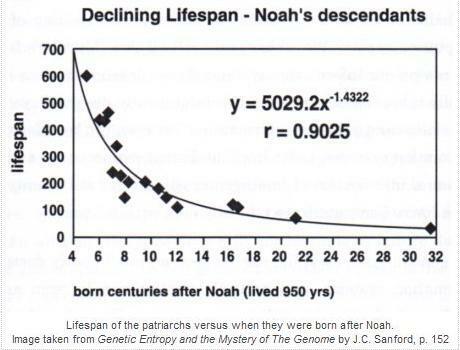 Michael Lynch’s estimate of a 5% drop in genetic fitness per generation produces an even more dramatic biological decay curve, validating the Hebrew figures. In addition science has now proved all women are descended from a single woman, and all men from a single man. The dates given for these two ancestors range from 25,000 to 450,000 years, far too short for the evolutionary timescale. As already mentioned, we now know that the accumulation of all these mutations has grown from 450,000 in palaeo Eskimos to approximately 3.6 million mutations of the human genome now becoming corrupt. Extrapolating backwards gives us a perfect human genome around 4,000 BC, far closer than the estimates mentioned above. In addition, a study of 6,515 individuals in 2013 concluded that approximately 86% of all single nucleotide mutations predicted to be deleterious arose in the past 5,000-10,000 years. These are definitely not figures and dates friendly to evolutionary theory. Below are a series of quotes from professional human geneticists on this very topic that back up the Hebrew evidence of a human species in decline, not evolutionary advancement. It becomes perfectly evident that the present number of children per couple cannot be great enough to allow selection to keep pace with a mutation rate of 0.1…if, to make matters worse, u (the mutation rate) should be anything like 0.5…our present reproductive practices would be utterly out of line with human requirements. (Our load of mutations. American Journal of Human Genetics 1950, 2:111-176) Muller assumed that our mutation rate was only 0.1 per individual per generation. We now know it is 1,000 to 10,000 higher than this. …an asexual population incorporates a kind of ratchet mechanism, such that…lines become more loaded with mutations. (The relation of recombination to mutational advance. Mutation Research 1:2-9) We now know that the massive number of mutations, the near-neutral nature of most of them, the presence of Y chromosomes in men, mitochondria in all humans, and the presence of large linkage blocks create the same ratchet for all sexually reproducing populations. This statement was made on the assumption of 30 mutations per generation. We now know it is at least 10 times that figure. Confessions don’t come much better than this. He is clearly admitting we are on an exponential biological decay curve leading to the extinction of all vertebrates in 100,000 to 1,000,000 generations. This reference is to all current endangered species, but admission is made that it is an issue for all populations. Howell was only looking at the mutation rate inside human mitochondria when he made this statement, which has a mutation rate of only one per person per generation! This statement ignores all other types of mutations. Another great confession. Without using the term, he is confessing to genetic entropy. Hoyle attacked neo-Darwinian evolution with the logic of physics. As a committed atheist, he, along with Francis Crick, believed the origin of DNA had to be alien panspermia. This statement was made in reference to protein coding regions only, which is some 3% of our genome. What about the rest, where 80% of all mutations occur? “We find the accumulation of new mildly deleterious mutations fundamentally alters the scaling of extinction time, lowering the genetic effective size to such a degree that even large metapopulations may be at risk of extinction.”(Metapopulation extinction caused by mutation accumulation. PNAS 98: 2928-2933). This research paper is particularly interesting, and honestly admitting to genetic entropy. “Without a reduction in the germline transmission of deleterious mutations, the mean phenotypes of the residents in the industrialized nations are likely to be rather different in just two or three centuries.” (Rate, molecular spectrum and consequences of human mutations. PNAS 107 (3): 961-968). This dramatic decline is due to modern medicine suppressing the natural selection of most human major mutations. Modern medicine is actually accelerating genetic entropy. So, genetic entropy does indeed exist in the real world; in RNA viruses, small populations and humans. Problems with the concept of mutational advance and natural selection are also acknowledged, over and over again, by the world’s leading population geneticists. The fact of genetic entropy is undeniable. The evidence is clear. However, because it undermines the evolutionary worldview, will humiliate the vast majority of academics, will force humans to acknowledge an intelligent external origin to the genome, and will result in the unraveling of an entire intellectual elite, it is fought tooth and nail with an array of counter-arguments that try to nullify its implications. Part Six of this essay will now address these evolutionary counter-arguments.